That's a great work. This will help a lot of administrators to protect their website by removing such links. Thanks for this interesting post. is this mast still for sail!? Is the mast still for sail ? Mast is still for sale. Sorry about the time delay,but I have been out of town. Any information on the bend charactistics? Is it perhaps one of the masts listed in Jeff Kent's great compilation of masts? Thanks. I'm looking for a pretty soft mast for a lighter sailor. When I see you again you are welcome to try out the hand laid Norton Winder which is very bendy, and almost indestrutable. Sail it with an FO1. Are you going to the N.A.'s ? 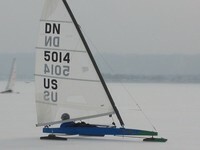 See the Green Lake guys, grey ice boat trailer.